Hey, all you east-coasters! Perhaps you thought I forgot about the fantastic submarine seascapes off the east coast of North America. I suppose I’m biased to the continental margin in my backyard, as evidenced by all my posts about California (e.g., here, here, and here). To remedy that, today’s Sea-Floor Sunday highlights the area offshore of New Jersey, New York City, and Long Island. 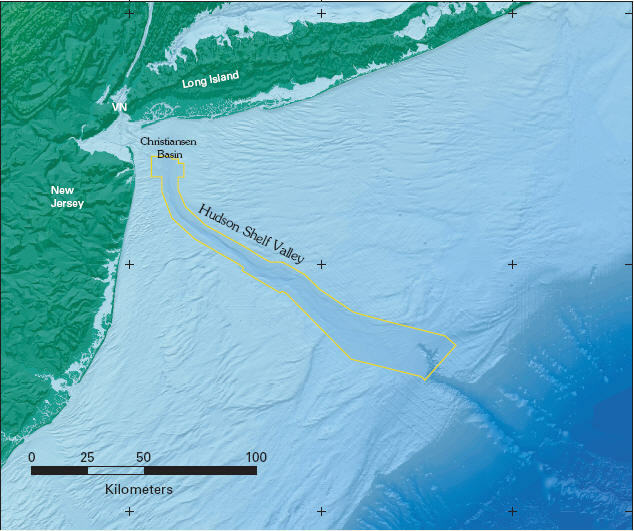 Specifically, the Hudson Shelf Valley cutting across the continental shelf. For those unfamiliar with east coast United States geography, New York City is at the far western end of Long Island (where it says “VN” on the image above), where the Hudson River empties into the Atlantic Ocean (image from here; click on it to see a higher-res version). The first general aspect to point out is how broad this shelf is compared to the west coast of the US. At this location, the shelf is 180 km (110 mi) wide; along much of California it is on the order of 15 km (9 mi) wide, more-or-less. This is a function of a “passive” continental margin vs. an active margin. Along the east coast, the continental to oceanic crust transition is an old rifted margin. The active spreading center (the Mid-Atlantic Ridge) is now 2,800 km (1,700 mi) away. In this area, the rifting of continents started in the Triassic (225 million years ago). In other words, this margin has been relatively quiet (tectonically) since then, hence the “passive” adjective. In contrast, the west coast is an active margin…the plate boundary (i.e., San Andreas Fault system) is right there and moving now. 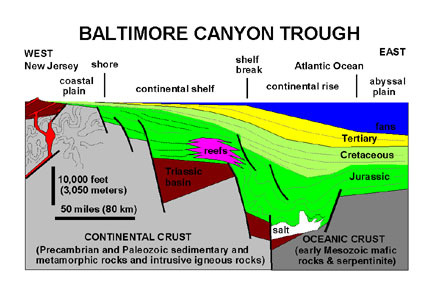 The figure below (from here) is a generalized cross section of the east coast continental margin (the Baltimore Canyon is just south of the Hudson area shown in the map above). The greens and yellows represent a couple hundred million years of sedimentary fill that overlaps this old rifted margin. You can see how the continental shelf can get so wide…the current shelf break is way out there far from shore as a result of sedimentary systems building out into the ocean. They are trying their hardest to fill that oceanic basin. Okay…back to the Hudson Shelf Valley. 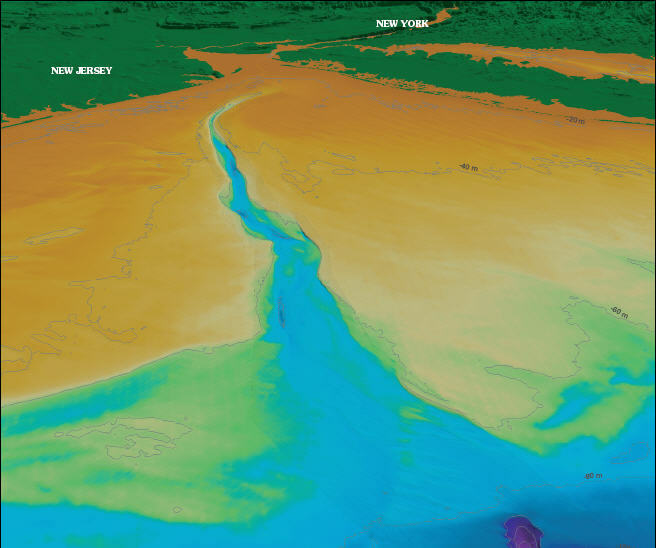 The image below is a perspective image looking to the northwest and nicely shows the valley extending from where the modern Hudson River mouth is (image from here; click on it to see a higher-res version). During the Last Glacial Maximum (~25,000-18,000 years ago) the sea level was much lower. The coastline was out at the present shelf break (on the image above, this is almost to the head of the Hudson submarine canyon, which is just barely visible in dark purple). Take a look at that generalized cross section above again…bring sea level down just a bit and you can see how that sedimentary shelf can build out. So, this shelf valley was the path of the Hudson River during this lowstand in sea level. But, its morphology as we see it today is not simply a relict river valley. Deglaciation following the ice age did not happen smoothly everywhere. As we map the sea floor more and study the evolution of these systems we are discovering evidence for huge meltwater flooding events. I blogged about the Lake Missoula outburst here and the English Channel event here. Research has revealed that this valley was also the conduit for similar large meltwater pulses during deglaciation in latest Pleistocene (~13,000-14,000 years ago; see cited references below). It’s difficult to know precisely how much these catastrophic events shaped the morphology of the Hudson Shelf Valley we see now, but it was likely significant. It is also important to remember that our knowledge of deglaciation events such as these is biased to the Pleistocene-Holocene boundary simply because it is the most recent. The Quaternary has several glacial-interglacial cycles. It is highly likely that each deglaciation period generated numerous meltwater flood events around the planet that were then overprinted with younger events. The development of human civilization coincides with (and likely is successful as a result of) the most recent deglaciation. Stories and myths about catastrophic flooding events are a part of most cultures and religions for a reason. Recently, Ole, Chris, and Zoltan all commented on the Black Sea flooding event. While this event is not tied to a specific ice-dam outburst event, it is also the product of rising sea levels following deglaciation. Thieler, E.R., Butman, B., Schwab, W.C., Allison, M.A., and Danforth, W.W., 1999. Large relict bedforms at the distal end of the Hudson Shelf Valley result from a glacial break-out flood. Eos Trans. AGU, v. 80, no. 17 (supplement), p. S193. Images and information presented here from this great USGS site. Check out additional info on this NOAA site. Hudson Canyon is also a great place for deep-sea fishing for tilefish (Lopholatilus chamaeleonticeps). Barnegat Light, NJ, where I spent numerous childhood vacations, claims the title of “tilefish capital of the world”. I don’t think we can discount continued erosion of these sub-sea canyons by turbidity currents. Nice job on this blog, by the way. I like your bit on Lake Missoula, named after my home town. If you look at the area along, and cratonward of the shelf break area you can almost geo-fantasize of there existing an asymetrical delta or lobate structures formed from coriolis winnowing. Any comments? bangin’ sedimentologist (nice!) … i’m not sure exactly where you are looking … maybe explain with reference to either or both of those figures above? are you looking at the area south of the Hudson Shelf Valley (HSV), to the north, or both? Just before the shelf break to the positon more landward which can be described as the intersection point from a line drawn down the crosshair in the center of the photo, and the lower portion of the yellow-outlined Hudson Shelf Valley. If you look there, and then pretend that you are looking across the Hudson Shelf northwards, it can be presuposed that this may have formed with an influential southward sediment drift. With respect to the third figure (N.W. aspect view of the HVS), try to orient yourself in the same position (on the south bank, where the tributary portion of the Hudson Valley Shelf fans out in a southerly direction). Im thinking that this could be a feature of longshore drift combined with discharge from the valley. oh yeah…i see what you mean now…i’m gonna have to do some digging into the literature about this area but a quick search found this image — the direction of the shelf currents (arrows) in that area are consistent with what you are suggesting, so it seems plausible that the asymmetry is indeed a function of currents. Exactly what the origin is regarding the currents themselves, I don’t know. I found that image on what looks to be a blog site devoted to the New Jersey shelf (I love the internet) … I bet you could inquire there and get more info than you ever wanted!